The popularity of Network-Attached Storage (NAS) devices is rapidly ramping up in both small businesses and homes, fueled by their usefulness and their increasing affordability. This surge in interest has led Western Digital to add a NAS-specific family of hard disk drives - the WD Red family of NAS hard disk drives. They have since extended that to a new line of NAS hard disk drives - the Western Digital Red Pro. Targeted at larger NAS systems that support 8-16 drives, the Red Pro drives are a refinement of the work Western Digital had previously done on their Red drives. 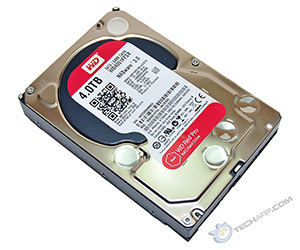 Now, let's take a closer look at the big daddy of the WD Red Pro family of hard disk drives!